University President LeBlanc said last month that the University has been “aggressively” fundraising for financial aid to combat the rising cost of higher education. Updated: Nov. 8, 2018 at 12:17 p.m.
Officials have fundraised almost $100 million over the past five years to support a student financial aid fund. University President Thomas LeBlanc said last month that the University has been “aggressively” fundraising for financial aid to combat the rising cost of higher education. 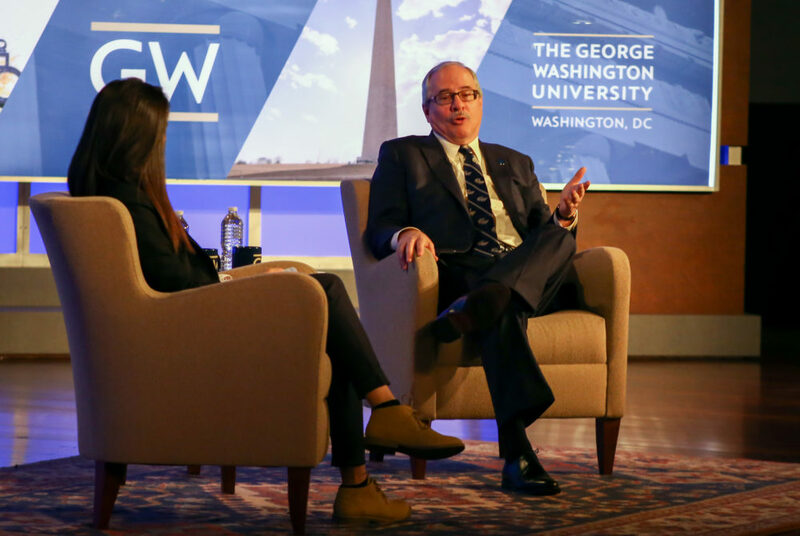 As GW’s cost of attendance is set to surpass $70,000 next year, officials said donors have donated millions to the Power and Promise Fund, which funds student scholarships. He said GW uses financial aid to ensure high-performing students are able to come to GW despite cost concerns. University spokeswoman Lindsay Hamilton said fundraising for student aid pools “is an important priority for the University.” She said alumni, parents and “friends” have supported the fund over the past five years. “Some choose to establish scholarships in specific schools or programs, and other donors contribute to Power & Promise general funds,” she said in an email. Hamilton said the Office of Development and Alumni Relations encourages donations to the fund through online profiles and videos of scholarship recipients, annual giving campaigns and donor events. She added that the University hosts an annual dinner honoring “the most generous” donors and allowing them to meet recipients. She declined to say how the fundraising strategy has changed over time or how the fundraising strategy is different from fundraising in other areas. She declined to say how much officials hope to raise for the program this year. Hamilton also declined to say how many events officials host each year to fundraise. The Power and Promise Fund was first established in 2009 with the hopes of improving GW’s affordability. Donors gave $13 million to the fund last year when the University overall raised the fifth-highest total dollars ever. During the University’s three-year-long $1 billion fundraising campaign, which reached its goal in 2017, financial aid attracted more than $177 million in donations. At the same time, GW has also continually increased its financial aid pool, which swelled to more than $300 million this academic year. Financial aid experts said raising money for students is the easiest way to lessen costs for students while maintaining services and quality of education. Robert Kelchen, an assistant professor of higher education at Seton Hall University, said it’s easier for universities to use philanthropy to fund students’ education than to cut costs for a college education because most people have been a student and are moved to give back because they know what it’s like to be in college. He said universities may struggle to fundraise money for the students who need it because donors tend to give to programs they care about instead of giving money to the general fund. Colleen Campbell, an associate director for postsecondary education at the Center for American Progress, a progressive research and policy organization, said that even though GW is fundraising for financial aid, low-income students might not be aware of the funding GW offers and be discouraged from applying anyway because they may look at the cost of attendance at face value. “It can be off-putting to have a high sticker price even if that’s not the price they are going to pay,” she said. The University began hosting a series of financial aid information sessions for prospective students this month – part of an effort to explain GW’s aid options. She said the growing public awareness of the high cost of college can help fundraisers make a connection with donors and encourage them to donate to students instead of other areas where donors might get more recognition, like a building named for them. Donors are also more sympathetic to students at universities with higher tuition costs than cheaper state or community colleges because the need for help seems greater, Campbell said. Katie Berger, a senior policy analyst for higher education at the nonprofit advocacy group Education Trust, said universities that prioritize financial aid fundraising show that they are committed to enrolling a diverse student body. “Institutions have a choice between being a finishing school for the very privileged or being a lever for social mobility,” she said. The Hatchet incorrectly reported that Robert Kelchen is an associate professor. He is an assistant professor. We regret this error.